From plain plastic bottles to trendy décor pieces, useful containers and fancy lighting – that’s right, your old pill bottles have amazing potential and they certainly shouldn’t be headed towards the garbage can. If you’re all about a good recycling or rather repurposing project, then we’re willing to bet that you’ll love our list: 15 innovative and fun ways to reuse old pill bottles! Not feeling too sure about hiding your house’s key under your front door’s mat? We can’t blame you – this method is certainly not a well-kept secret anymore. 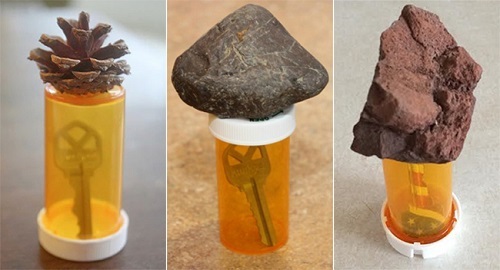 So how about using your old pill bottles to perfectly camouflage your key in your backyard? Simply place your home’s key in the empty pill bottle, then glue a stone or a pinecone on the lid and place it in the soil, with the stone above the ground. Good luck to the thieves figuring this one out! And if you’re like us and have managed to lock yourself out in your backyard on more than one occasion, this solution is pretty much as good as it gets.